Long Tall Sally sent me some pieces from their spring collection to try and I am excited to share what I got with you. The collection is full of floral prints and bright colors. I received the Navy Cotton Tapered Trousers in size 14 and 36″ inseam, the Tie Detail Blouse in a size 12 and the Maple Ballerina with Ankle Strap in a size 13. The blouse is a beautiful coral color. It is a sheer, lightweight flowing blouse with a jersey camisole underneath. The cami is not attached so you can wear it alone or layered underneath another shirt. Both the cami and the blouse are long. I was surprised that the cami actually is longer than my belt line. The blouse itself hits underneath my behind. I like to top, but it might be a bit too loose for my taste, but I am sure I can make it work. I’ve been needing a good pair of pants so I was really glad to give them a try. Sometimes you get tired of wearing jeans all the time. Wanted to add a bit of diversity to my wardrobe. 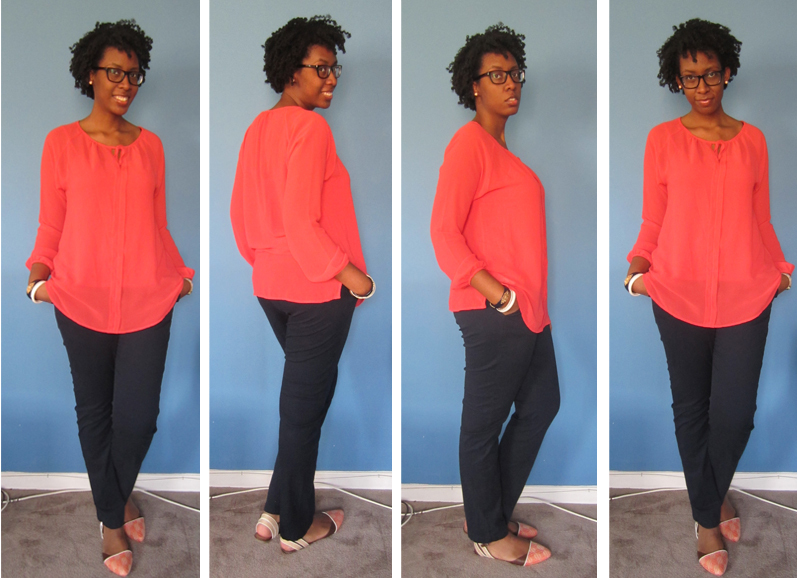 They are a comfortable, straight leg pant perfect to wear to the office or on a weekend errand. Did I mention that they are comfortable? Well they are. They are not too tight or restricting. I can actually stick my hands in the pockets with no problem. And these pants are made out of cotton so that they are lightweight and breathable. They also fit pretty great. There is no weird gap in the back but I still wouldn’t go without a belt. Luckily it comes with one! I got the 36″ as opposed to the 38″, so the hem would hit right at my ankle which is what it does. I do wish that the hem tapered in a bit more but overall I really like these pants. On to the flats. I figured I could use some more dressy flats in my collection and I am happy to add these into the fold. I picked these ballerina flats because there are unlike anything that I own. They are a “bit funky” (mom’s words) which I like. 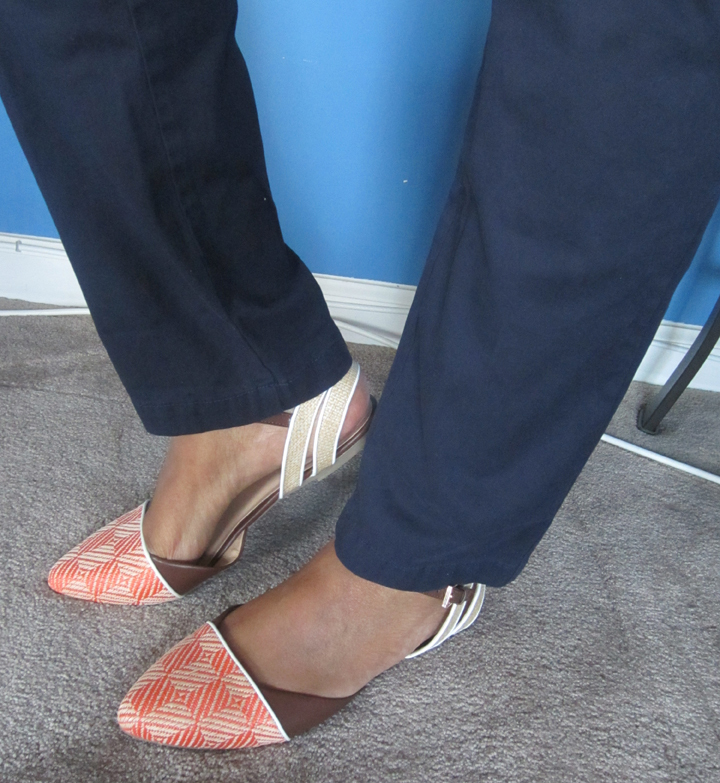 They are a pointed toe flat with a coral and beige raffia pattern on the toe and faux leather straps. I can’t say I could walk a mile in these but they don’t pinch my feet or anything like that. The toe is actually nice and roomy which you can’t always say with a pointed toe shoe. I really like this outfit as a whole. I like the slim leg pant paired with the pointed toe flats. 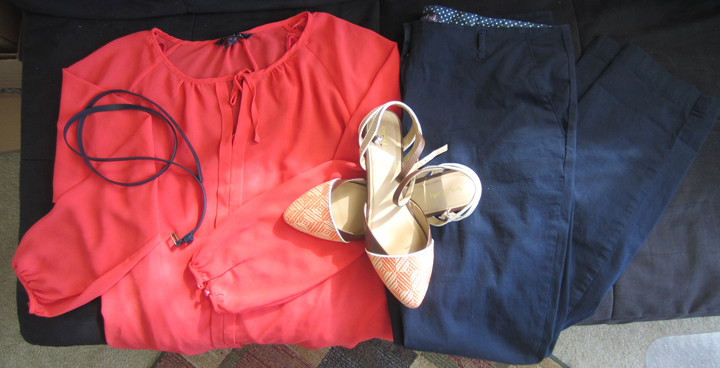 The coral of the shirt goes with the colors of the shoe, but also complements the pants well. The shirt could also go well with a pencil skirt or some skinny jeans, I think. Like these pieces? Anything else you like from LTS’s new collection? Let me know below! Yes! Those shoes are fabulous. I am always a fan of a navy/orange-ish color scheme. You look great in this outfit. Hi Elayna, I found you from Isy B Shoes’ post about tall blogs (she is giving mine a mention, as well as yours). It would be great to network! I now follow your blog here, as well as on FB and Twitter, and hope you will follow back. Perhaps we could do a guest post for each other’s blog some time?? That would be great. My e-mail is apelova, do you want to e-mail me and we can decide what to do?